No fridges, no McDonald, How did they survive? 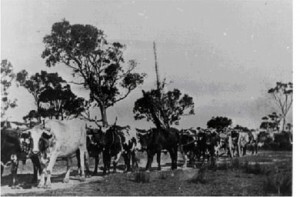 It was difficult providing food for a pioneer family. Flour, tea and sugar were the main items carried in from the nearest store. Treats were treacle and dried meat. The flour was made into damper. Settlers planted hop bushes so they could have yeast and then be able to make proper bread. Fish from the creek was the only fresh meat and bacon was a real treat. A house cow was another important item to buy as soon as there was some grass for the cow to eat. They drank the milk and made butter from the cream. Because they had buttermilk they could have a pig, but a pig needed a good fence which had to be made first. Later families acquired some chickens and a vegetable garden. This meant eggs and fresh vegetable. Food gradually improved to include potatoes all year round and other fruits and vegetables in season as well as meat from the farm. Without freezers though meat could not be kept for long without salting it. The pioneers invented a wide variety of pickles and chutneys to make salted meat more palatable. The clothing of the late nineteenth century was by the standards of today very thick and uncomfortable. Women and girls wore long skirts, usually made of wool; blouses, petticoats and long underwear all of cotton. Men wore woollen flannel t- shirts and flannel shirts and long pants. The singlet invented for shearing became popular in the summer. 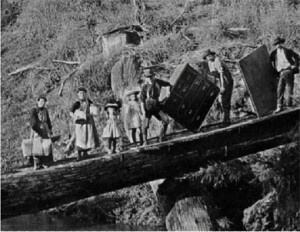 A family moving house across a log bridge over the Tarwin. Note the every day clothing of the pioneers. An ever-present danger in the early years. Being hit by a falling tree was a major cause of death in the South Gippsland region in the early days. Many a land clearer lost his life by being struck by a branch or tree. The first person to be buried in the Leongatha Cemetery was Dennis Maher who was working on the construction of the Great Southern Railway when he was killed by a falling tree while he slept in a tent near the present railway station. People were even killed when a buggy was unluckily hit by a falling tree as it moved along the road. 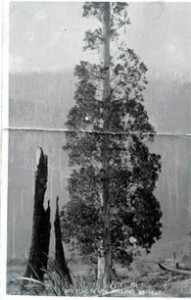 Note the man on a spring board near the top of the tree. He is taking the top off the tree before moving further down and cutting the tree in sections. This was a dangerous occupation but many men did it. When a broken leg could be fatal. Medical help was very limited. In the early days of settlement in South Gippsland the nearest Doctor was in Sale. People had to handle their own injuries and something like a broken leg could be fatal. It was not unknown for scrub cutters to sew up severe cuts for others or even themselves or to splint a broken limb. Families had very limited medical knowledge and had to get by. Women travelled to relatives elsewhere to give birth and were not keen to bring small children into the area until the houses were reasonable. A story that best illustrates this is the story of a small member of the Dodd family from Dumbalk North. About three weeks later a two year old Dodd boy also died — again Mrs Dodd was alone as her husband was off selling cattle. This child was also buried on a Sunday next to his brother on the banks of the Tarwin. Travel by the light of the full moon. The roads were as very bad. Dusty and full of ruts in summer and muddy in winter. People rarely travelled far unless they had to do so. The horse was the main means of transport other than walking. Early settlers were known to walk 20 or 30 miles just to pay their lease money on time. If a function such as a wedding was held it was usually during the day or around the full moon so people could see to go home. Once the land was at least partially cleared goods and logs could be moved by bullock team. The tracks were muddy indeed and it was a very difficult job to try and turn them into roads. 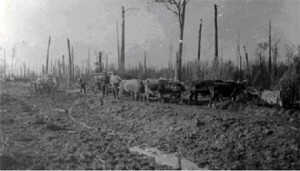 Here bullocks are being used to make a road. “The disastrous Gippsland Fires (1898) occurred when I was in Leongatha, and my house had a shingle roof, and was practically surrounded with fire. We had a very anxious time and only by keeping the roof deluged with water was the house saved. “Indeed one night the situation seemed so precarious that I removed the family to the township, fully expecting that the house will be demolished during the night, but in the morning we found that the fire had passes on and that the house was intact. Many families lost their homes, possessions and family members from bushfires.